The Attic Magazine proudly presents Outernational Days 2 in July 7-9, 2017, at gradina Uranus and The ARK Bucuresti. 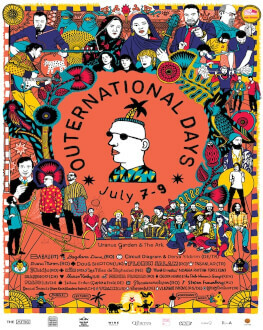 Outernational Days 2 will bring on stage bands and musicians from all over the world - Kenya, Niger, Senegal, Lebanon, Turkey, as well as Europe (Germany, Austria, Switzerland and Romania) and USA. Besides concerts, the festival will present a series of thematic DJ sets, artist talks, panels, percussion & didgeridoo workshops and lectures. • Panel discussion: 'Cultural Appropriation'. Speakers: Raed Yassin, Rose Satiko Gitirana Hikiji, Jan Rohlf, Derya Yildirim, Valeriu Nicolae. Hosted by: John Doran. Speakers: Speranța Rădulescu, Margaret Beissinger, Adi Schiop, Andrei Dinescu, Dan Bursuc. Hosted by Cristian Neagoe. *Co-financed by the Administration of the National Cultural Fund (AFCN) / Arts of Spectacle – Music. *Supported by the Swiss Arts Council Pro Helvetia and Red Bull Events.